MU ORI (Mu Orionis). Look just northeast of Betelgeuse in Orion to find fourth magnitude (4.12) Mu Orionis, the star part of the Hunter's upraised right arm (he's drawn facing you). A history spanning three-fourths of a century revealed the star to be double, then triple, then finally quadruple, a "double-double" in the mold of Mizar and Epsilon Lyrae, but all closer together and more like Castor. Mu Ori A, the more massive pair, orbits Mu Ori B with a period of 18.644 years, while the "A" pair (Aa and Ab) orbit in 4.447 days and the "B" pair (Ba and Bb) in a nearly identical 4.784 days. 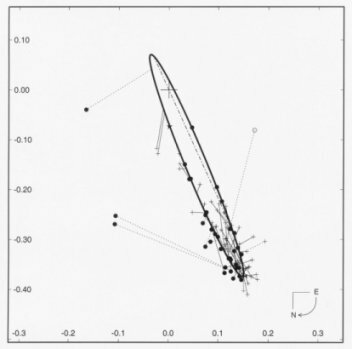 Don't try to separate A and B (apparent magnitudes 4.31 and 6.16) through the telescope, though, as at best they are only a few tenths of a second of arc apart, the star analyzed through motions of absorptions in its spectrum and through sophisticated interferometry.